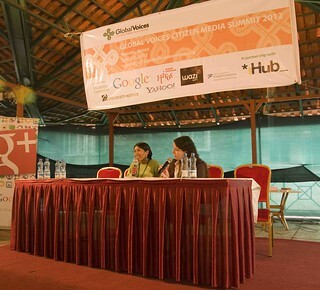 Rising Voices is a Global Voices program which has supported 37 projects around the world to help put their communities online. Whether they face limitations of electricity or connectivity, Rising Voices offers grants to help communities get online and create content in their languages. Eddie Ávila, the panel moderator, tells us about his own experience receiving a Rising Voices grant as part of Voces Bolivianos in 2007 and introduces our speakers, Boukary Konaté (Mali) and Victoria Tinta (Bolivia). Boukary talks to us about finding a way to connect in rural Mali (you can read his full story here). Boukary comes from Sanogola-Bamoussobougou, a small village in Mali with six families and 85 residents — 2775 km from Bamako, the capital of Mali. One day, a sergeant in the Malian army stopped in Boukary's village with a broken motorcycle. The sergeant asked if Boukary went to school; he didn't. It took the sergeant several attempts to convince Boukary's family to let him to go school. Leaving Boukary with a family member, the sergeant urged him to study hard and support his family someday. Boukary tells us that university was beyond his means, so he went instead to a school for teachers. As a teacher, he sometimes went to cybercafes to use email but didn't use the Web very much. While he was passionately interested in the broader world, he assumed that such knowledge would require university. One day, Boukary was gripped by a strong desire to connect. He typed the Malian phrase for “I want” into Google, and found the Global Voices website. After emailing the site, he received a note from Claire Ulrich in Paris (at this point, he thanks Claire and everyone claps). Claire taught Boukary how to use Facebook and Twitter, and to translate on Global Voices. After working together for five years, they met for the first time last week. Boukary has also worked together with colleagues in the Global Voices French community to fundraise and organise a mobile Internet connection for his village and other remote places in Mali. 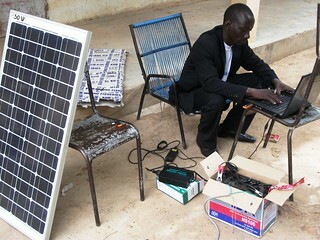 With support from Rising Voices, the village has set up a solar panel, generators, batteries, and an Internet connection. After the success of this project, Boukary and colleagues have started the Segu Villages Connection Project to create cultural links between villages and cities. Going from school to school, they have taught over 800 people how to use the Internet. Boukary concludes by expressing his hopes that the children he teaches will grow up to use the Internet and link even more villages. Eddie Ávila next introduces us to Victoria Tinta from Bolivia, who is using the Internet to keep the Aymara language alive (more background on Global Voices) (Juliana Rincón Parra interpreted Victoria's talk). Victoria was born in the province of Los Andes in La Paz, Bolivia — in the highlands region of the Aymara region. Before 1994, Bolivian children were not allowed to learn in their own language. Education was only in Spanish, English, and French. When Bolivian education reforms allowed people to learn in their native tongues in 1994, parents didn't want their children to learn in Aymara. They would remember that their grandparents, in the time of the conquest, had faced discrimination. They didn't want their children to experience the same. Victoria's parents were proud that she could learn in Aymara; they always told her that speaking her own language was not a crime. Like many others, she knew how to speak Aymara but not how to write. In Bolivia, there are more than 37 official languages. Aymara has two million speakers. After high school, Victoria studied linguistics and lanugages at university. There, she met other young people who knew how speak but not to write Aymara. As students, they learned how to write in Aymara and use the Internet for research. Victoria and her friends couldn't find any Aymara content on the Internet. In response, they convened @jaqiaru, an Internet site in Aymara. Jaqi aru publish Global Voices Aymara, Wikipedia, and Aymara news sites. On the Aymara wikipedia, they work on history, information pages for Aymara communities, and others. Last year, they participated in the Wikimana conference in Israel, where they met the founder of Wikipedia, Jimmy Wales. As a result, many Aymara are interested in editing Wikipedia. Two weeks ago, Victoria and her colleagues gave workshops to professors on how to use Facebook. @jaqiaru is also spreading the Aymara Internet to Flickr, YouTube, and Twitter. Using Facebook, they have been able to link together Aymara speaking communities in Argentina, Spain, and Ecuador. Victoria is now the editor of Global Voices Aymara and has cultivated interest among local youth to translate posts into Aymara. Maintaining Aymara content on the Internet is challenging; most people edit and translate articles from Internet cafes, which is expensive. All the same, people in Aymara are enthusiastic hope that their ongoing work will inspire the people of other indigenous languages.